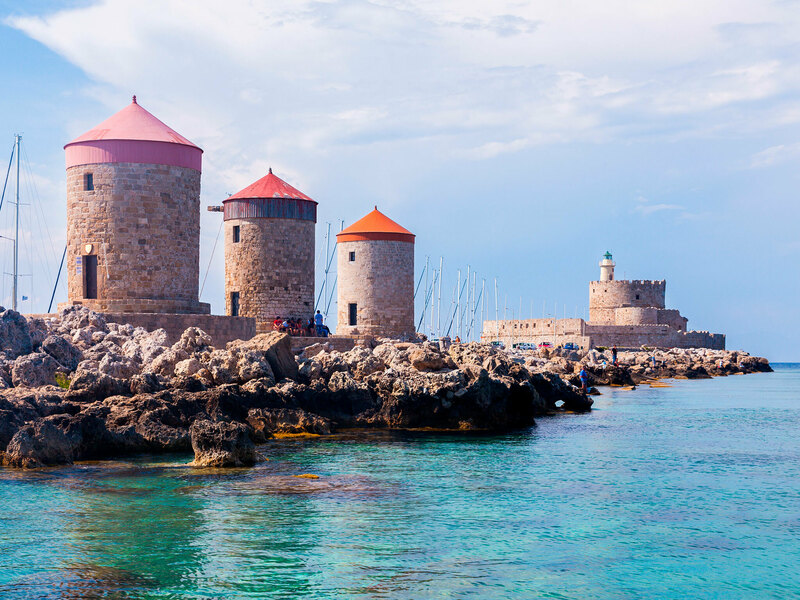 The best things to do in Rhodes heavily rely on the island's history, which is unlike anywhere else in Greece. Its position in the Aegean Sea once placed it at a crossroads of trade and sea-faring. Today, the entire island’s a time capsule telling stories of the different civilisations who have called this place home. 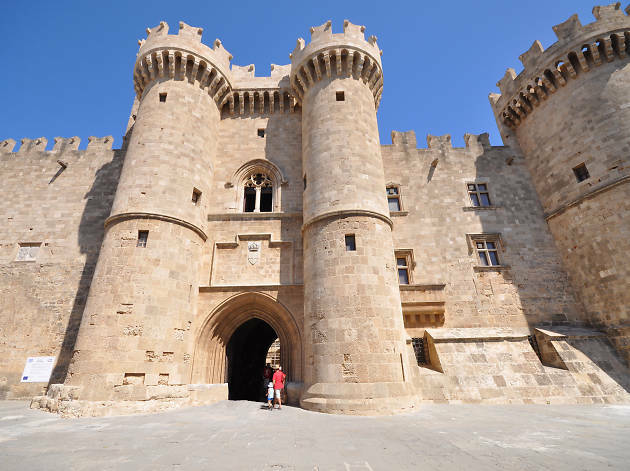 Visiting the medieval city of Rhodes is like walking through a time machine that will spit you out into a world of trusted knights and fairytale castles. Here, buildings are preserved, easy to explore and admire. (In 1988, it was listed as a UNESCO World Heritage Site.) Ancient temples stand alongside medieval walls as well as churches, mosques and other structures influenced by the occupiers of eras gone by. 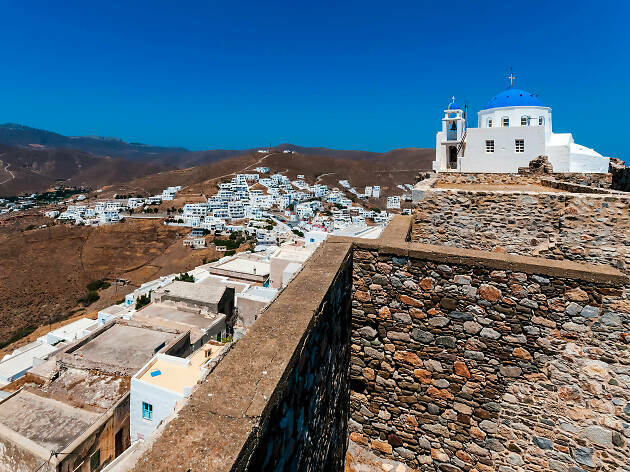 Once you’re done soaking up all that history, there are still homely villages, lush valleys, beautiful hotels and relaxing beaches to discover. What is it? The cobbled Street of the Knights is one of the best preserved medieval streets in Europe. Why go? Strolling this street makes it easy for one to imagine what it must’ve been like in the era of knights that ruled fourteenth century Europe. 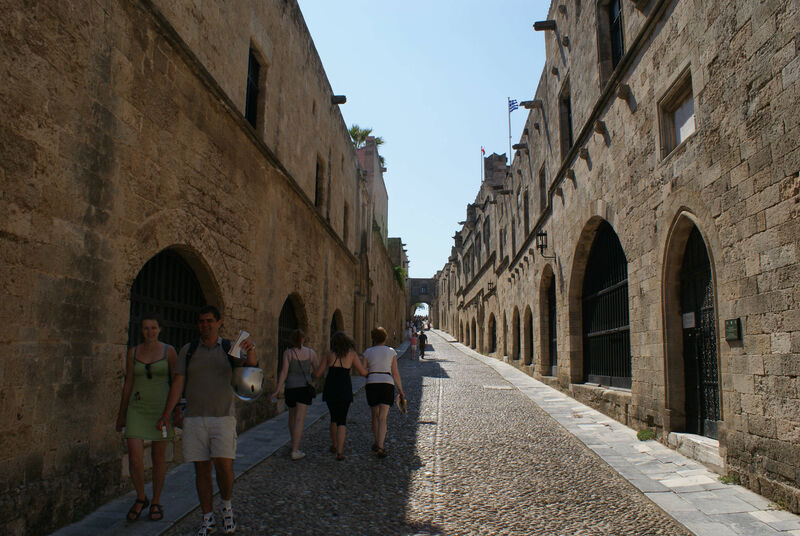 Cobblestones, stone walls and grand iron doorways are still intact as well as the medieval inns which hosted the soldiers of the Order of the Knights during a time when Rhodes Town was a thriving multinational trading port and city. What is it? 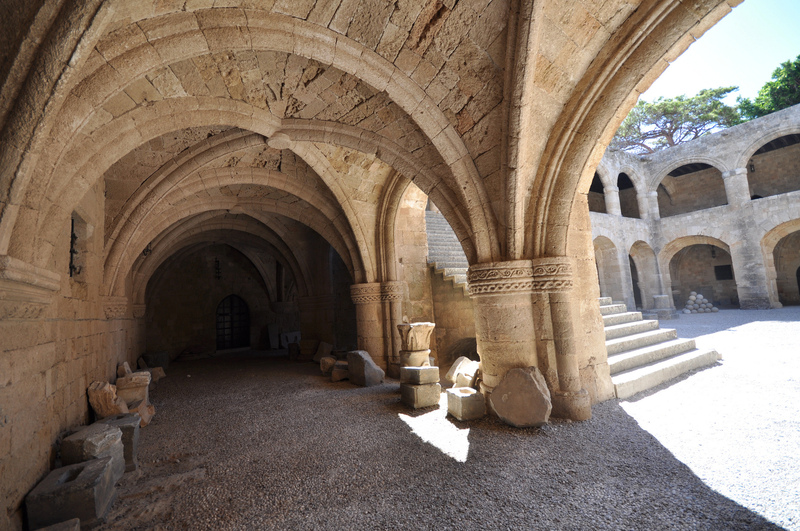 This Archaeological Museum once housed a state-of-the-art hospital built for the knights that ruled the island. Why go? With all of the history that surrounds you, this museum helps you get a keen understanding of the highlights to walk home with. 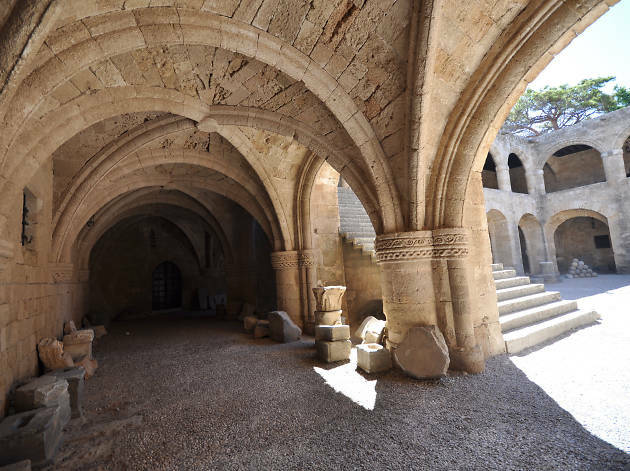 The fifteenth-century Hospital of the Knights was ahead of its time when it was built, a wealthy institution that served the needs of the prestigious Knights of Saint John. The exhibit halls that were once hospital wings now display some of the finest artefacts and ancient Greek marble statues from the island including two impressive statues representing Aphrodite, the Aphrodite of Rhodes and Aphrodite of the Sea. What is it? Like its name imbues, this historic palace was built for grand people and grand events. 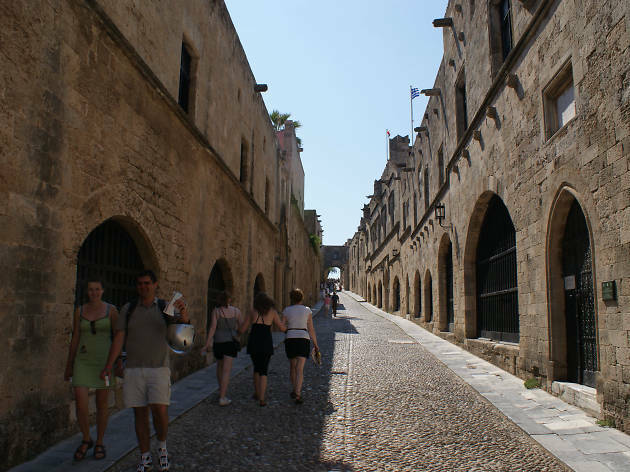 Today the massive space is a museum about the history of Rhodes. Why go? To understand the Old Town, take time out to learn about the building of the massive walls and towers of this palace which was once critical in protecting the city. 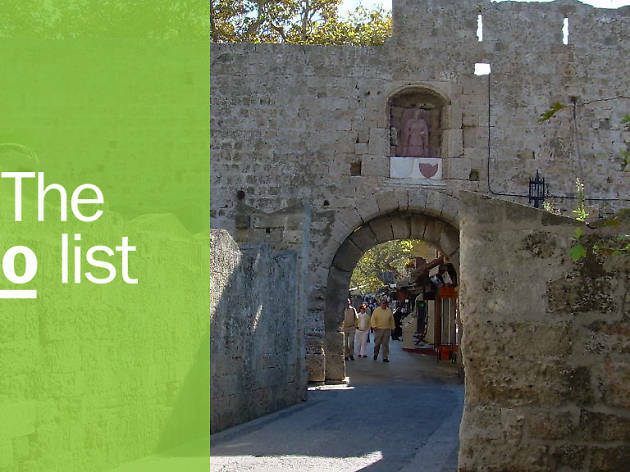 Today, it’s a museum that brings its guests on a journey of Rhodes’ history through artefacts and mosaics. It’s also a survivor, standing after a Turkish siege in the 16th century and an ammunition explosion in the 19th century. 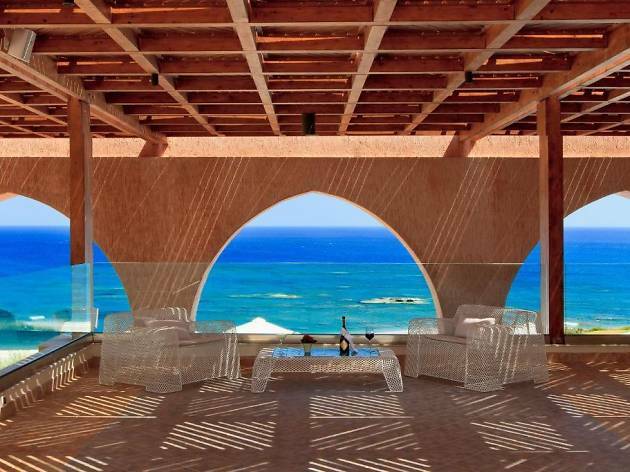 It was restyled in the 20th century as a holiday home for King Vittorio Emmanuele III of Italy. What is it? This is one of the Old Town’s most notable structures, built in the seventh century with Byzantine architectural features. Why go? From the top of this historic tower, you’ll find one of the most panoramic views of Rhodes’ port and the Old Town. Stone steps lead to the entrance past life-sized sculptures of knights in armour. It’s a great spot for photos and an evening drink with a view. What is it? The ancient Greeks built this scenic temple for the Greek god Apollo at the Acropolis of Rhodes, just outside of Rhodes Town. Why go? Drive up to Agios Stefanos hill to visit the Acropolis of Rhodes to understand life here during ancient Greece. 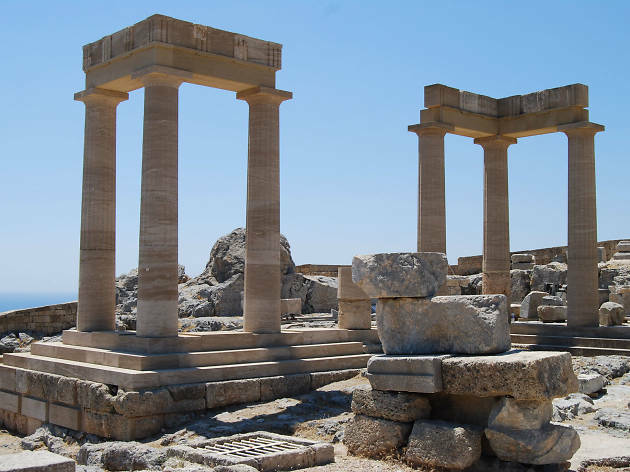 The central building features the Temple of Apollo which dates back to 300 BC. 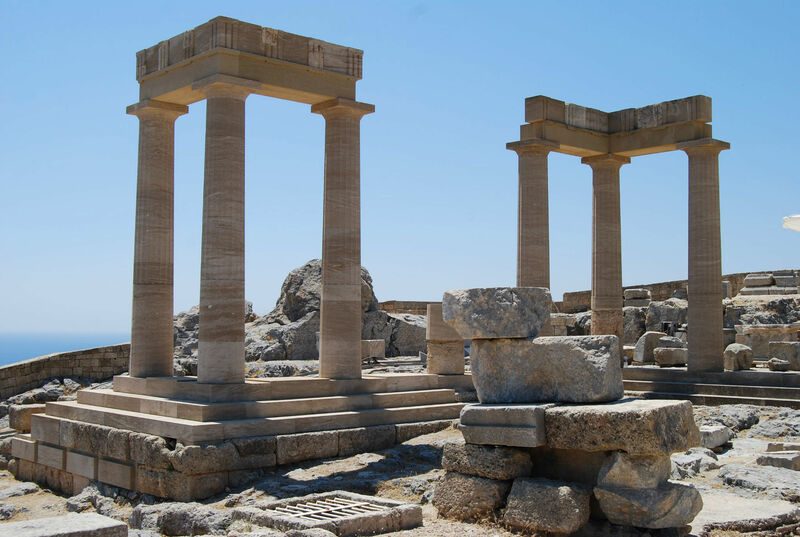 Walk among fascinating ruins including a zone of sanctuaries, Greek temples and more – all dating back to the Hellenistic and Late Hellenistic periods. 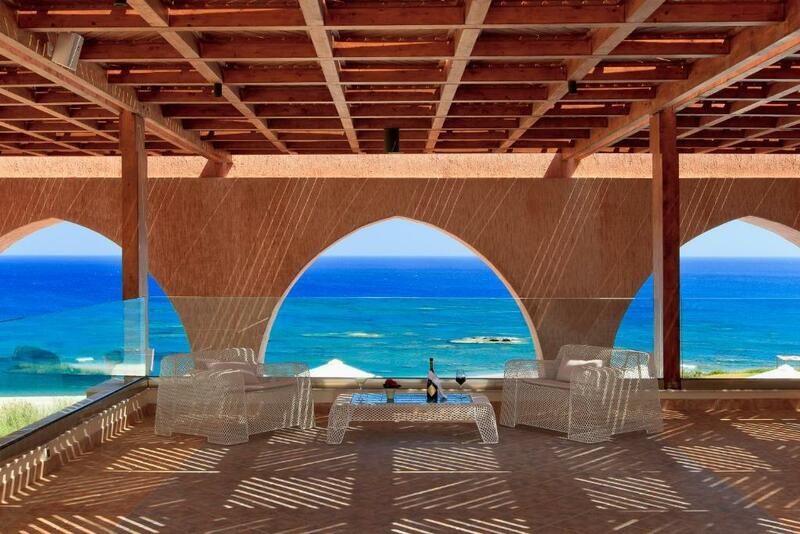 Then admire the panoramic views of the island. What is it? This pink domed, fifteenth-century mosque is a testament to the diverse cultures that ruled the island. Why go? 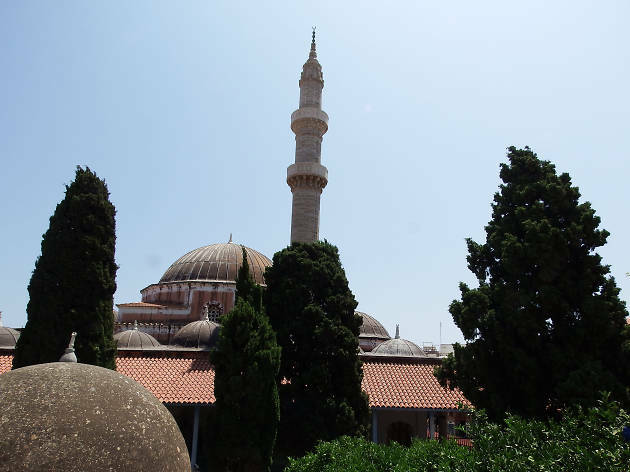 The Ottoman Turks built this rose-coloured mosque after their victory against the Knights of Saint John. 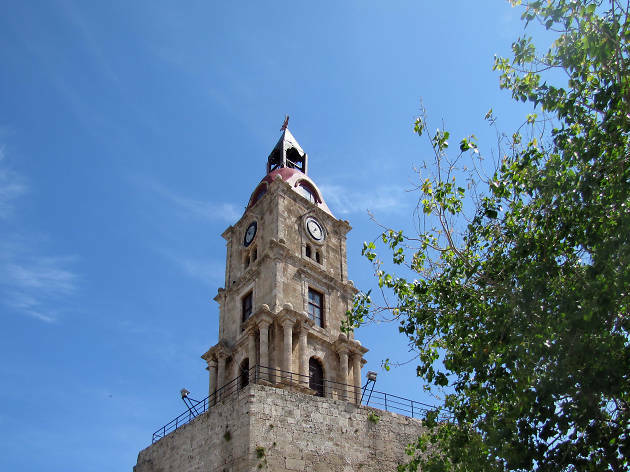 It is one of the grandest structures built on Rhodes during Ottoman times and features notable architectural elements including its impressive minaret which was built during the rule of Suleymaniye the Magnificent. What is it? This photo-worthy eleventh-century church is one of the most interesting religious structures in the Old Town, having gone through several incarnations. Why go? Also known as the Church of Panagia tou Kastrou, this place of worship has taken on different purposes depending on the rule of an era. In the fourteenth century, the Knights of the Order of Saint John inscribed their coats of arms, while Ottoman rulers turned it into a mosque. What is it? This fifteenth-century circular fort once served as the protective entry point to Mandraki Harbour. Why go? 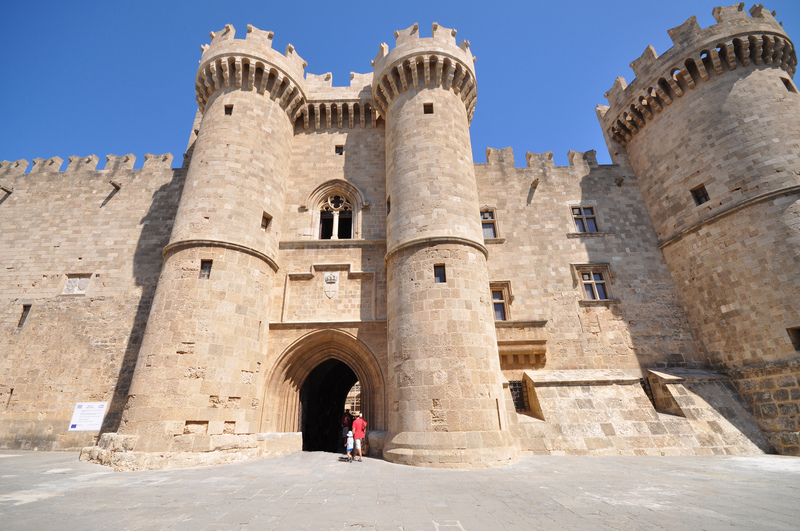 Built by the Knights of Saint John, the fort is a landmark in Rhodes’ ancient harbour. Here, two famous Rhodian deer statues are set on columns next to three medieval windmills that once ground grain. This walkable area is a favourite stroll for locals. What is it? 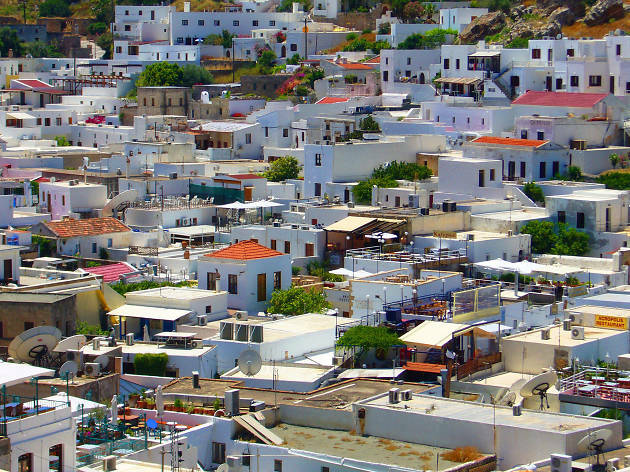 This whitewashed town is spread around the foot of a 116m rocky hill, crowned by a centuries-old acropolis. Considered one the most picturesque towns on the Greek islands, Lindos’ narrow paved lanes lead travellers through a village that was a powerful city of trade in ancient times. Why go? To admire the architecture – which is a charming blend of ancient and medieval. The quiet, atmospheric corners sit in the shadow of the clifftop acropolis. Don’t be surprised if you need to give way to local donkeys while you’re exploring here. The tiny streets here cannot accommodate cars so local residents and small boutique hotels employ animals to help with transport and deliveries. 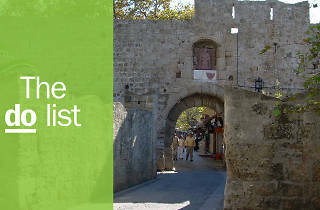 Looking for a place to stay on Rhodes? We’ve combed the rest of the island too to bring you a carefully edited selection of Rhodes hotels, from boutique bolt-holes in the shadow of Lindos’ acropolis to seriously stylish sea-facing spa resorts.